Native of China, introduced into North America in 1784 as an ornamental. It is a fast-growing weed tree, sprouting from seeds and suckers, especially in alleys, beside walls and buildings, and in similar narrow places; also in fields, meadows, dumpsites; on shores and river banks; and along railroads. First collected in Michigan in 1892 in St. Clair Co. Doubtless far more widespread than the map indicates, but by-passed by collectors. 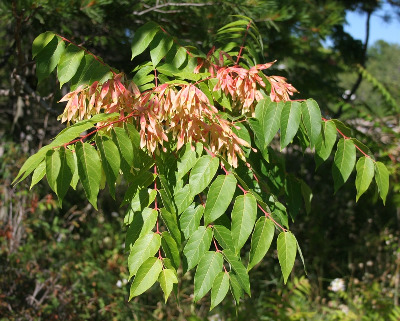 This robust smooth-barked tree, with large pinnately compound leaves and large inflorescences of small flowers, is polygamo-dioecious; some trees produce copious elongate samaras with a single central seed. The foliage and especially the staminate flowers are strong-smelling. MICHIGAN FLORA ONLINE. A. A. Reznicek, E. G. Voss, & B. S. Walters. February 2011. University of Michigan. Web. 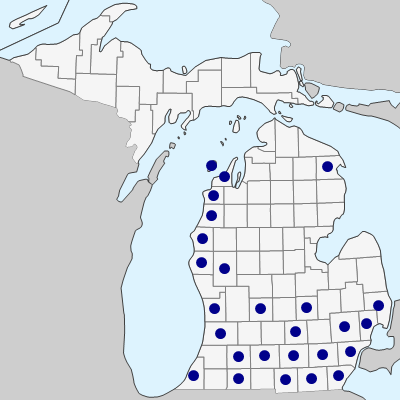 April 21, 2019. https://michiganflora.net/species.aspx?id=2686.